Raven Course Helps Soldiers Soar To New Heights - USA Patriotism! Eleven New Jersey National Guard Soldiers were students in a ten-day Unmanned Aerial System Operator’s Course led by master instructors from the 254th Regional Training Institute during October 2018. 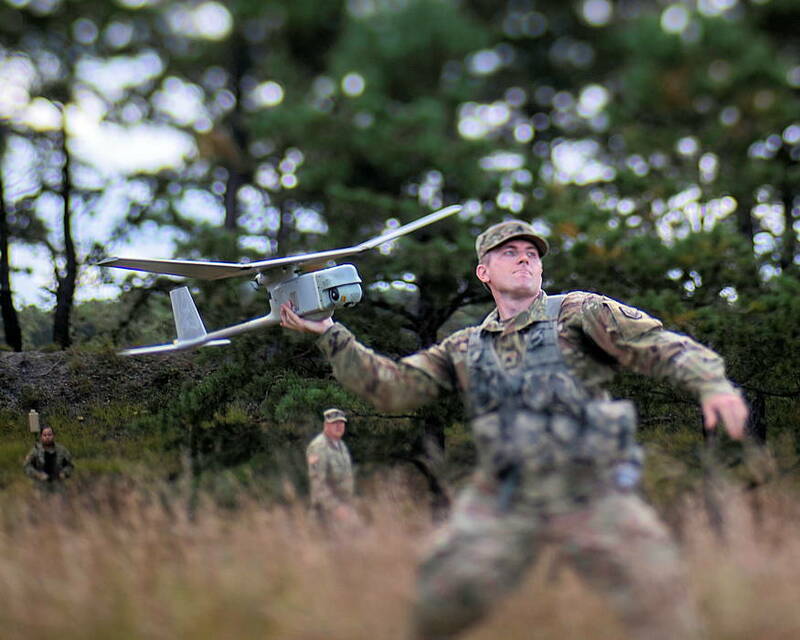 The Soldiers became familiarized with the RQ-11B Raven, a hand-launched remote controlled aircraft. The Raven, like all of the tools in the U.S. Army arsenal, is designed to be a force multiplier on the battlefield. Soldiers participating in the course had several days in the classroom learning fundamentals, followed by simulator time, practice launches, and cap stoning with a ruck march onto the ranges for tactical Raven application. Staff Sgt. Cyrus Manahan, a Soldier with the 328th Military Police Company, believes that Ravens and systems like it are going to be more common throughout the Army. Most of the Soldiers in the class were military police, and stated that the Raven would be very well suited to provide convoy security, patrol over watch, and base defense operations. 2nd Lt. Fatima Agilar, a platoon leader with the 328th Military Police Company, wanted to learn about the Raven to assist her troops. The students praised the Regional Training Institute instructors for their passion and expertise with the Raven.